On Tuesday, crews raised the scoreboard at the new Milwaukee Bucks arena. The full HD scoreboard has 9.4 million LED lights and weighs 71,000 pounds! It was also reported that construction continues to be “on time and on budget.” Click here for more. 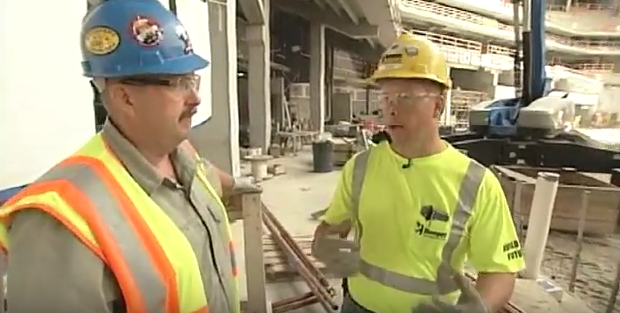 Today’s video from the Building Wisconsin TV series features a plumbing tour of the new arena. Host Stuart Keith meets with Ron Babler and Mark Schepp from the Hooper Corporation and Steve Breitlow from Plumbers Local 75.